Mediator is a corporate display sans-serif font family created by Alexander Lubovenko together with Manvel Shmavonyan and published by ParaType, the first privately-owned post-soviet Russian type foundry in many years. Featuring 30 fonts, lining figures and standard ligatures, extensive Latin, Cyrillic and Greek language support, multiple weights and multiple widths, Mediator comes as a true text workhorse that will help you when heavy usage is needed. 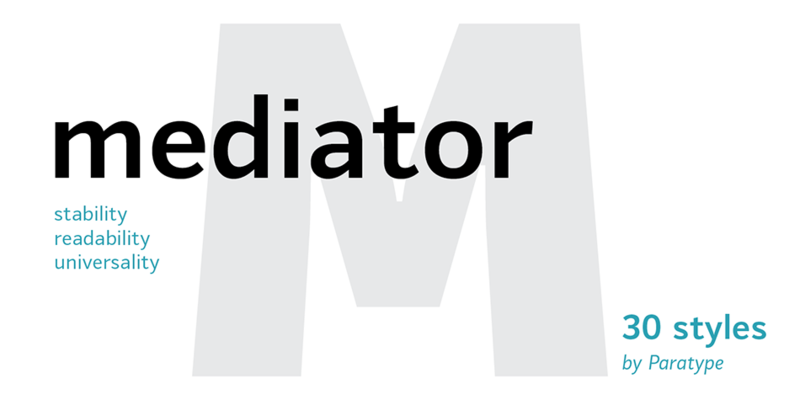 Mediate messages with Mediator! A font description published on Thursday, July 7th, 2016 in Alexander Lubovenko, Fonts, Manvel Shmavonyan, ParaType by Andrei that has 3,045 views.